Chromatography Method Development Services From ACCTA, Inc. Better peak shape and resolution, improved sensitivity, and reduced analysis time! 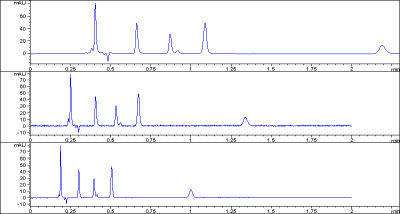 Do you want your chromatograms to look like this? This wasn't an accident; it was the result of careful planning, experimentation, and execution. That's what we do! Dr. Bicking assisted scientists in the National Banana Research Program (NBRP). One of our strengths is finding the "sweet spot" of conditions for a particular method. The first step in a successful development is selecting the correct column. We recently published a article in LCGC magazine entitled: "A Global Approach to HPLC Column Selection Using Reversed-Phase and HILIC Modes: What To Try When C18 Doesn't Work". View the digital version. While we can't promise to have your method completely developed, we can provide an initial estimate of how much additional effort will be required. All this for a single, reasonable fee. Or, we can do it all, and develop the best possible method that meets your requirements.